A small amount of blood is drawn from the patient similar to a routine blood test. Once the blood is drawn, it is then placed into a centrifuge device. The centrifuge is a machine that spins the blood at high speeds in order to separate the blood into red blood cells and concentrated platelets. Once the blood is separated, the red blood cells are discarded and what we are left with is concentrated Platelet Rich Plasma (PRP) that is ready to be used in the treatment process. Platelets are rich in growth and healing factors, which stimulate collagen production in the area that is treated. Platelet Rich Plasma (PRP) can be topically applied or injected into certain areas of face or body to increase collagen production and improve acne scarring and skin texture, while smoothing fine lines or wrinkles. For men or women that are suffering from hair loss, PRP can also injected into the scalp to stimulate the hair follicle. PRP can also be combined with other cosmetic treatments, such as microneedling, for additive collagen producing benefits, as well as speeding up the body’s repair processes. What differentiates our PRP System? 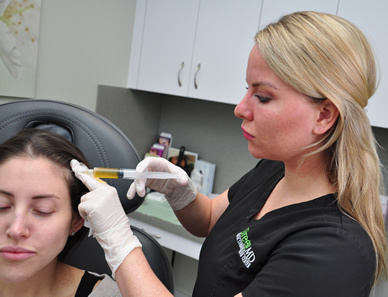 We use a patented, superior technology to ensure the purest and most consistent concentration of Platelet Rich Plasma. 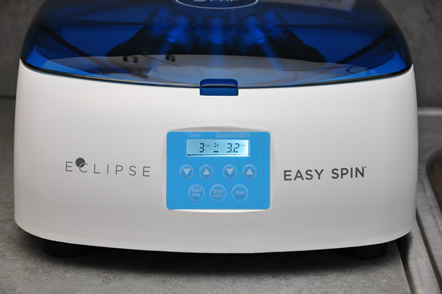 The Eclipse PRP system is an FDA-cleared safe and effective Class II medical device. Our office is trained and highly qualified to successfully perform treatments under the supervision of Ryan Greene, MD, PhD. The platelet concentration influences how much collagen is produced, and therefore impacts the eventual outcome. 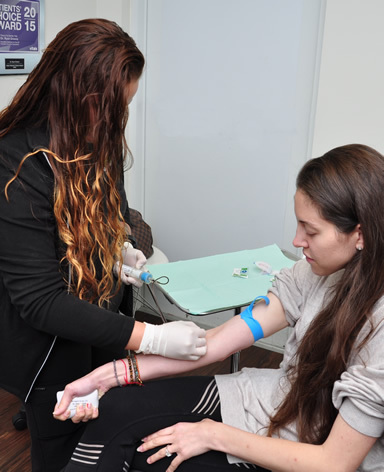 Results are optimal at our precise concentration that is achieved with the Eclipse PRP processing of the blood. This is important because a concentration that is too high can lead to adverse effects, while one that is too low will not be as effective in creating new collagen. Consistent platelet concentration leads to predictable performance, as we remove the most contaminating red blood cells and the most inflammatory white blood cells. These could cause inflammation, vascular injury, and impaired healing if not removed. There can be some mild discomfort during treatment, but this is minimized with the application of our specially formulated numbing cream prior to treatment. There may be mild bruising, swelling, and redness which can lead to a day or two of “social downtime”. Typically the next day the skin has a pink or sunburned appearance. Patients may also experience dry, peeling skin. We usually recommend to avoid exercise 24 hours after treatment. Are there any risks with PRP? PRP is an especially safe treatment option with no risk of allergic reaction because it involves your own blood components. Similar to other injectable treatments, other adverse effects include bruising, swelling, temporary discomfort, or infection. In order to prevent bruising, we recommend to avoid blood thinners, such as aspirin, NSAIDS (such as Advil, Motrin), or fish oil, for at least 7 days prior to treatment unless medication is prescribed by your medical doctor. PRP injections usually take 10-15 minutes, however expect to be in our office for approximately one hour. This includes a consultation, drawing and centrifuging the blood, and numbing the area prior to injection. Combining PRP with microneedling, also lengthens the treatment time. Most patients benefit from a series of PRP injections depending on the condition being treated. Three or more treatments are usually recommended. Certain conditions, such as severe scarring or hair loss, may require additional treatments. Who is not a candidate for PRP injections? 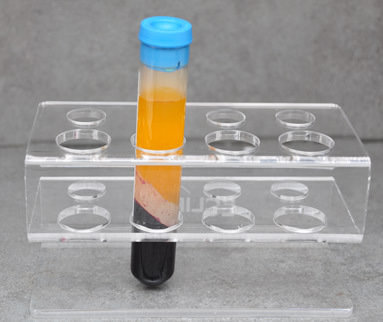 Patients with severe anemia, low platelet count, abnormal platelet function, or active systemic infection are not recommended to undergo PRP treatments. Most people start to see results after 2-3 months. But you will continue to see improvement up to 6 months after treatment. What is the “Vampire Facial”? This term is just another name for the aesthetic treatment of administering PRP into the skin through microneedling; it refers to the use of a patient’s own blood products to rejuvenate the facial skin by encouraging collagen production. Do I have to do microneedling with the PRP facial treatment? We highly recommend the combination treatment of PRP with microneedling. Microneedling creates access for the platelets to enter the skin. This is the best way to administer the PRP for maximum effectiveness. Please give our office a call to schedule at 954-651-6600.